Oliver and Felicity are disappointed after they learn that William is hiding something from them. 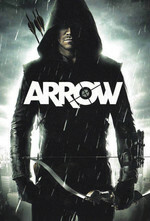 Wanting to focus on his family, Oliver steps back from his Green Arrow duties and lets the team take over tracking down a serial killer, however, when the team becomes targets of the killer, things take a bloody turn. TV Line - Inside Arrow's Blackstar Reveal: How Can It Be True? Why That Last Name? Any Chance for a Family Reunion? Even after seeing the "evidence" of a typewriter and the notes being described as "typewritten" I still don't believe those were crafted on a typewriter. The text looked too large and dark/heavy. Unless it was some type of large-print typewriter. Felicity is a terrible parent. I don't care how mad at William she was, making Oliver take away William's waffles is cruel and unusual punishment. I'm sorry, but I don't believe in depriving kids of meals as a behavioral correction and control method. Open-floor plans are terrible for privacy. Felicity said she would put away the groceries in order to give William and Oliver a chance to talk, but the best she could do was move the bags to the counter, because remaining in the kitchen a couple of feet away wouldn't have afforded them any privacy at all. I can understand why the writers wanted to tie the events of today into the future flashes, but damn, this show is hard on Canaries. I really think by depowering Dinah, they did her character a real disservice. Sure Black Siren is still around if they want a super-powered songbird, but I'm a bit miffed it's Dinah that has to pay the penalty for Oliver's friendship with his little prison buddy. Sure it's not full-out fridging, but it feels like it's veering into that territory. A couple of threads back, I said I wasn't too upset to have seen Curtis "killed off" because it seemed like the writers were done with his character arc. I guess the actor was feeling the same thing if he's leaving the show (or the production team couldn't figure out what to do with Mr. Terrific). He might be a more useful character to show up as an infrequent guest star (either on Arrow or on other DCCW shows). They were telegraphing Mia's big secret revelation pretty hard, so as that Den of Geek headline above points out, it was hardly a surprise. That seemed like a pretty quick wrap-up for the stalker storyline. I guess that's a good thing because we usually find good reasons to complain when they drag out the arcs for bad villains beyond what the characters are warranted, but honestly, I wouldn't have minded another episode or two of tracking him down. I guess, however, they needed a quick and easy way to dispose of William and ship him off to his grandparents, and this was a good way to fill that need. I noticed that about the notes. Last week they were all impossibly large for a typewriter, but this week there was a mix of type sizes. Re: Curtis leaving. Echo Kellum said in a couple of interviews that he wanted to spend more time with his kids in Los Angeles so they’ve been planning his exit for more than a year (and he’s happy to come back for guest appearances). I forgot to mention Rene's "detective skills." He thought the note was from some punk kids. Seriously, where is your average "punk kid" going to find a typewriter these days? I didn't think it was obvious the notes were written on a typewriter, especially with the bigger fonts last episode (Maybe Stanley ran out of whatever he was using for that and had to settle for the smaller typewritten notes) so I wouldn't fault Rene for that. Also, "punk kids" these days are really into retro stuff, like typewriters. I actually forgot about Stanley for a bit, but I guess no we're done with him. He will not be missed. Although the actor did pretty well with showing how tense he was. I was also impressed with Stephen Amell effectively choking back tears when he was saying goodbye to William. I guess now we know why Curtis isn't in the future scenes. I must have missed the hints that Mia was their daughter, but I got spoiled by a random headline somewhere so the reveal was lost on me. Ugh, Stanley. May he never return. Hey Stanley, if you didn't enjoy your "medicine" so much, why are you doling it out to others? Gawd, I hope he gets therapy in jail. Olicity are terrible parents, yes. Godspeed, William, get thee to your grandparents and stop annoying me on the television. That said, I about died laughing on "No, I'm gay and she's my mom....stepmom." I still say Felicity isn't dead. No corpse, not dead. I don't know what to say about them having a kid now. But yeah, clearly the terrible parenting continued. Godspeed, Mr. Terrific. I always liked you. I'm supermad about Mr. Terrific leaving. He was the only spark of joy in the new ensemble cast.